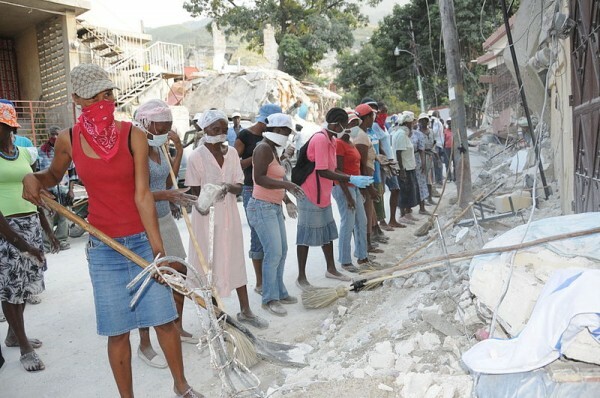 Haitian workers clear rubble from a street following the January 12, 2010 quake that devastated Haiti. Photo courtesy UNDP. When the earthquake struck in Haiti, it changed Dominique Anglade’s life in Montreal forever. Her parents, Georges and Mireille Anglade, were the first Canadians confirmed killed in the aftermath of Jan. 12, 2010. They were crushed to death in their family compound in the Mont-Joli neighbourhood of Port-au-Prince. Anglade, a 39-year-old management consultant and mother of two, was lost in grief for several months. But her parents’ deaths and the scenes of devastation from Haiti also steeled her in unexpected ways. She used her management experience to come up with a new model for delivering aid to Haiti. The organization, dubbed Kanpe (Creole for “stand up”), was already in the planning stages when the quake struck. Kanpe seeks to cut through the maze of aid organizations operating in Haiti by providing rural families with a guide: A Haitian caseworker that helps them assess their needs and find sustainable solutions. Kanpe tries to help Haitians help themselves, with an end goal of financial autonomy. “Despite the pain I was going through, I thought of all the people in Haiti who don’t have parents or children anymore. People lost everything. And I thought, I can’t sit here in Montreal and feel bad about myself when there is such devastation in Haiti. I am probably in a better position than most who have been touched by this,” said Anglade, who was born in Montreal, but lived in Haiti for several years as a teenager before returning to Canada for university. Sonia Verma Then: This Magazine editorial board member, 1999. Now: Globe and Mail reporter, foreign and international desks.